This is yet another new addition to my rice cooker cake creations! I was planning to do a new flavour of rice cooker cake after receiving so many positive feedbacks for my rice cooker banana cake. It's amazing how many people are interested to "bake" cakes using the rice cooker! Then I happened to see this steamed butter cake from HomeKreations, and I thought this is it! My rice cooker banana cake was also inspired by her steamed banana cake recipe, so I am quite confident that if I adapt this recipe from her, it will work out well again. So I looked at her steamed butter cake recipe, decided to take 3/4 of the ingredients and add in a little baking powder, then cooked it in the rice cooker for 1 hour (62 minutes to be exact). Here is the result, doesn't it look just like a moon-crater cake from outer space? The omnipresent little hand of my baby girl, always appearing at the right time to touch my cake! This is a very simple yet delicious butter cake, I assure you it doesn't taste like a steamed cake at all, in fact it can even pass off as a baked cake if you don't look at its golden brown crunchy crust and the moon-crater-like surface. This recipe is highly recommended, try it if you have a rice cooker at home and if you would like to try rice cooker baking for the first time. This cake is made from a toshiba rice cooker (model RC10L-MI, 5.5 cup capacity) without baking function. Recipe adapted from Roz@HomeKreations, ingredients reduced to 3/4 and steaming method changed from steamer to rice cooker. ** 1 tbsp of plain yoghurt or milk ** as per reader suggestion. 1. Beat eggs, sugar (and ovalette if using) until it becomes thick and fluffy, about 2-3 min using cake-mixer on highest speed. Add in sifted flour and baking powder and mix well using spatula. 2. In a separate bowl, use cake-mixer to beat butter, condensed milk and vanilla essence until fluffy. 3. Add in butter mixture into the egg mixture little by little and mix very briefly using cake-mixer on lowest speed. Do not over-mix. - The original recipe asked for 1/2 tbsp ovalette, which is a sponge cake stabiliser / cake emulsifier commonly found in Singapore and Malaysia, and frequenty used in sponge cakes to give a light, fluffy texture. I used to have ovalette brought back from Singapore, but it has long expired and I have thrown it away. But I remember reading somewhere that condensed milk can achieve the same effect as cake emulsifier, so instead of using 1.5 tbsp condensed milk which is the amount required after reducing to 3/4, I used 2 tablespoonfuls and it worked quite well for me, the texture of the cake was not dense at all. - This recipe also requires the use of superfine flour as it has a high ratio of butter+sugar to flour. I used cake flour since I can't find superfine flour (superlite flour/top flour) in Belgium. If you don't have cake flour, you can substitute 140g cake flour with 116g of plain flour plus 24g of cornstarch /corn flour, and then sift it together a few times. - For those of you who wants to try this cake without cake-mixer, it maybe possible since HomeKreations did not state whether to beat by hand or by mixer, but if you are beating by hand, you would have to beat the eggs and sugar until thick and pale yellow in step 1, and in step 3, make sure you fold and mix the egg mixture and butter mixture thoroughly. The batter is quite thick and not so fluid, hence I found it better to use a cake-mixer at low speed to mix for a few seconds in step 3. 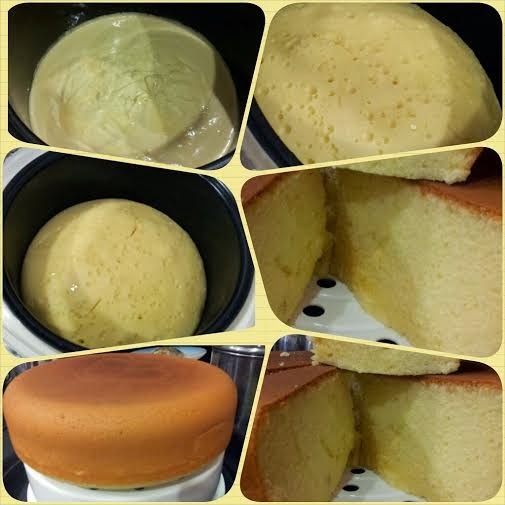 On 3 Jan 2014, HS Ong sent me a lovely email with a few photos of her rice cooker banana cake and butter cake baked using the baking function of her Tefal 10-cup rice cooker. She doubled the recipe and it took her 1 hour. Here is a picture of her rice cooker butter cake. Thank you HS for your positive feedback! [Note] If you are new to rice cooker baking, do read this FAQ before you try out your first rice cooker cake. If you would like to receive more updates, do click like on my Facebook page. Wanna check out our Rice Cooker Cake Challenge #2 Roundup? I have briefly seen the exterior of your rice cooker, is that "National" brand? Does it have a non-stick rice pot? Wow, it must be a good rice cooker to last that long! Even if it doesn't beep or turn off cooking by itself, you should give it a try since you know roughly how long it will take. Although if yours is a 10-cup capacity, it will have a larger base and hence take a shorter time than mine. I have read comments of others who have tried the banana cake, for one of the ladies, even though it took her 2 hours from start to end as she had to wait for the cooker to cool off before she could press cook again, it still turned out well. So give it a try, you never know! Hello there, looking forward to try this recipe soon. i'm wondering can i omit baking powder or any raising agent and use meringue and fold in technique instead to raise the cake? thanks in advance. Hello there, i just realized i didn't put my name on my comment before. i really want to try this recipe. can i omit baking powder or any raising agent and use meringue and fold in technique instead to raise the cake? thanks in advance. You can, if you really don't have baking powder at home, but I won't recommend it. This is a butter cake, the result will be denser if you leave out the raising agent. The original recipe even used 1/2 tbsp ovalette (cake emulsifier) which I replaced with baking powder. I bake the cake based on your recipe with 10 cup capacity rice cooker. However,after 15 minutes rice cooker have turn to "keep warm" mode and I have to stuck small piece of cardboard at the rice cooker switch to force it to "cook" mode. After about 10 minutes, I notice a burn smell coming out from the rice cooker. The cake still looks like what you show above but does not taste good. Argh, what have gone wrong? I think you should increase the recipe proportionately (say double the amount) to suit your rice cooker capacity and since every rice cooker is different, it may take less than 1 hour for yours, you have to watch it carefully. From experience, once I could smell the aroma of the cake cooking, I knew the cake was cooked. Good luck! Thanks for your feedback, really appreciate it. I guess every rice cooker is different. Some rice cookers like mine which is a Toshiba RC10L-MI, you can press "Cook" again immediately after it switches to "Keep Warm" mode, and it never gets burnt. I don't have a cake-mixer, can't I use hand instead? And my rice cooker have a BAKE button, can I just pressed that? If you dun have a cake mixer, I suggest you try my other 2 rice cooker recipes, the banana cakeor the moist chocolate cake. If yours has a bake button, of cos you can press that but the timing will be different. Good luck! Jaylene Chuah - I just did d butter cake recipe according to ur rice cooker n I steamed it instead. . It rise nicely n taste nice... shall share both moist chocolate cake n this butter cake with my colleagues as well.. Thanks alot..
How long did u steam it? Hi, I tried out the recipe in a Philips rice cooker with Cake function. Mine is a 10cup capacity rice cooker and it took 45mins to cook. Cake turned out very good. Thanks. Thanks for your feedback, Hersheys ! I am just wondering whether you know of any way to make the top of the cake (the yellow portion) looks nicer? (without putting frosting or cream etc to cover it) cause it looks really bumpy and hole-y and might not be very presentable as a "gift". Why don't you turn it around, the base should be pretty smooth, flawless and crusty too. Mine had a few tiny blemishes as there were few scratches at the base of my cooker pot. I always present my rice cooker cakes upside down by the way. Wow! I didnt know that Daiso sells paper stencil. I will check them out one day! :) Thanks for the suggestion. Oh, but will the icing sugar/cocoa powder be able to stick to the cake? Don't sprinkle too much and as long as you don't flip it over. The top of this cake is so holey, I'm sure it will stick. You can cover it with chocolate flakes or shredded orange/lemon peel also. Another suggestion will be to use those glittering pens for cake deco to write or draw something. Or spread a layer of jam on top of the cake. Another idea that I just thought of, drizzle some honey or condensed milk on top, that will be really nice! No, SR flour is not the same as cake flour which will produce a lighter texture. I tried the recipe with the full amount as my rice cooker is for 8-cup capacity. It turned out great!!! Initially I thought it won't as I'm using hand whisk and my rice cooker is of a cheap brand (Akira). But amazingly, after 1 hour, with the button keep turning to "keep warm"every few minutes, the cake turned out great. Each time it turned to "keep warm" mode I let it cool for few minutes b4 clicking it back to "cook" mode. Thanks for the recipe! Would love to share the picture but how do I send it to u? Hi dkhor, Great to hear good news from you! Thanks in advance for willing to share your cake picture. :) You can send by email which is under my blogger profile under the contact, not putting it here cos otherwise robots/spammers will pick up the email address and spam my blog. Measure out about 1 cup plain flour (140g), remove 2 tbsp and replace with 2 tbsp cornstarch and sift together 5 times. Castor sugar is finer than regular cane sugar, I believe. You can use regular cane sugar if you grind it in a food processor to make it finer, otherwise it is too coarse for making a butter cake. As for agave nectar, sorry but I have no experience with it. Thanks for your feedback. I am glad that you adapted the recipe according to your taste and preferences. This cake is actually slightly smaller than the steamed banana cake and the moist chocolate cake, so I'm not surprised it took a shorter time. The timing given is just a guideline and it varies based on the brand, model and capacity of your rice cooker, but the good thing is once you try out 1 cake and know the timing, the rest of the cakes will take around the same time. I dunno how to console you, Zanice. It's the first time someone complains to me that the recipe causes damage in the rice cooker, usually the cake will only get burnt if the rice cooker is not the fuzzy logic type. If your rice cooker is spoilt by just cooking for 20 min, which is not even long enough for cooking porridge, treat it as a blessing in disguise and get yourself a better rice cooker such as Toshiba, which will last you longer and you can cook nice cakes in it. This is my sincere advice. What brand and type of rice cooker are you using? I think maybe your rice cooker is not suitable for making cakes. Have you tried steaming the cakes in a steamer? I'm using buffalo brand rice cooker with stainless steel pot and fit 10 cups rice. I tried the butter cake recipe. It turn "keep warm" just a few mins after cooking. And need to wait for about 10 mins to turn it back to "cooking".. Therefore I use something to make the button continues cooking. But after around 15 mins the cakes burned... Can please advise? Pls refer to my faq on how to make rice cooker cakes. You are advised not to force the cook button just to continue cooking, if not you risk getting a burnt cake or damaging your rice cooker or both. There is a reason why your rice cooker doesn't allow you to re-press cook button immediately, just have to wait until you are allowed to do so. Hi Miss B, thanks for your receipe! I've tried the rice cooker butter cake today but just wondering if the texture is supposed to be more dense. Mine was pretty dense and didn't rise as much. Was wondering if it was undercooked or the eggs I used were the normal ones instead of the xl ones. My rice cooker has the cake function and I baked it for 45mins. Thanks in advance! Does the cross-section of your cake look anything like mine? Or does it have a kueh like layer at the bottom? Wharf is the brand and cup capacity of your rice cooker? Have you tried making other cakes using this cooker or is this your first cake ? Did you beat the butter until light and fluffy? I used zojirushi 5 cup rice cooker. Yah first time doing rice cooker cake. My colleagues told me that rice cooker cakes tend to be more dense but yours look so fluffy! Yah I did beat until light and fluffy too. Can't really say that rice cooker cakes tend to be more dense, are you comparing with steamed cakes or oven-baked ones? It depends on the recipe and the rice cooker used. Usually recipes that do well in rice cookers are steamed cake recipes. Why don't you try the banana cake or moist chocolate cake recipe 1st. The Z brand is a good rice cooker, I think you just need more practice. hi, wonder the butter in melted form or ...? should the egg white n yolk seperated? Thank you for a wonderful great easy recipe to follow. Just baked this morning and it turned out fabulous. Thank you. Just a question as I am very new to baking. For step 2, you mentioned to beat till fluffy. I used a hand mixer and beat for almost 10 mins and the Colour of the butter turned to slightly paler yellow and it was lighter. Or should I have continued further and beat till it is as light as cotton wool? Appreciate your advice. Thank you again Miss B. Very encouraging to be able to bake this lovely cake with all the right textures and flavours. Can't wait to try yr other recipes too. The RC chocolate cake, banana cake and walnut cake are quite nice, do try them. Hi Miss B thanks for your reply. Should I steam it with medium heat for 45mins same as previous cocoa cake? Or 1 hour? I tried baking this many times. It is the most delicious butter cake ever. We use a panasonic sr-mm18n model with 10L capacity. Also tried the banana cake. So simple that my father (who never bakes) tried it out himself and it was also delicious. Recipe that can never fail! 端午节快乐 Happy Dumpling Festival ! Finally I am online on FB !!! Little Thumbs Up - It's Curry Time!